The Certified Lay Minister (CLM) is a designation in the United Methodist Church for lay persons who, after specialized training, are recognized and utilized to enhance the quality of ministry to small-membership churches and/or team ministry in churches. Read more about the CLM designation here. Introduction to Ministry Overview – Basic overview of the tasks of pastoral ministry leadership including Wesleyan theology, preaching, and administering the local church and pastoral care. Participants are asked to prepare a seven to ten minute sermon/message in advance for this course. Cycle A—Intermediate Preaching – This course explores the purpose of preaching and the processes of planning, exegesis, sermon development and delivery that are necessary for relevant and passionate preaching. Participants will prepare with advance reading and by writing a sermon for presentation during the day. Cycle B—Worship and the Sacraments – In this course, participants look at the elements of worship and what makes it effective. They also review and practice officiating the sacraments (Wesley’s means of grace), including: communion, baptism, weddings, funerals and confirmation. Cycle C—Leadership in the Wesleyan Way – This course will help participants further develop and practically apply Wesleyan theology to their congregation and mission field. Cycle D—Disciplemaking Systems – In this course, participants will learn the essentials of pastoral leadership in the important task of disciple-making. Having a specific strategy to grow followers of Christ is key to congregational vitality and growth. This course will offer foundational ideas and practices and allow participants to begin developing their own strategy relevant to their context. All laity must follow the process outlined by your District Committee on Ministry in conjunction with ¶271 of the 2016 Book of Discipline in order to be approved for the CLM designation. 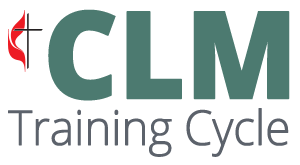 Satisfactory completion of all the CLM training courses is required to acquire and maintain certification but it is important to note that the process of certification as a lay minister is separate from the training. Detailed information regarding this can be obtained from your District Superintendent. However, regardless of certification intent, all lay persons interested in enhancing their ministry are invited to attend these trainings.